Following the fairly recent first release (R1) of Sage CRM 2018 back in December, the second release (R2) is now available and brings some great new features that we’ll take a closer look at in this article. Sage CRM 2018 R2 continues to build on what’s probably the heart of the application - the calendar. This release further extends the great enhancements in Version 2018 R1 with new filtering options in all calendar views. Action and Status filters can be added to Day, Work Week, Week and Month views and are retained for the session duration. In addition, the calendar now displays dates according to your personal settings in the Preferences area. The results of your MailChimp marketing campaigns are now visible and available on the Person Marketing Tab. The details provided display marketing campaigns that this person has been included in, the number of email opens, and the number of clicks per campaign. MailChimp campaign results are now also available on the Company Marketing Tab for any campaigns that used a company email address such as sales@company.com. Together, these new campaign display options provide a quick and convenient way to see how engaged a given contact or company has been without having to run reports in MailChimp and use two different applications. Depending on what country you do business in, legislation in your area may require additional steps in gathering consent before you’re able to send marketing communication. With Sage CRM 2018 R2, you now have the tools to manage and track this process easily. With the new consent tracking capability, you can store the expressed agreement to receive marketing via email, text, or calls on the Consent Tab in contact records. Requests for consent can be sent directly from Sage CRM using preconfigured email templates. 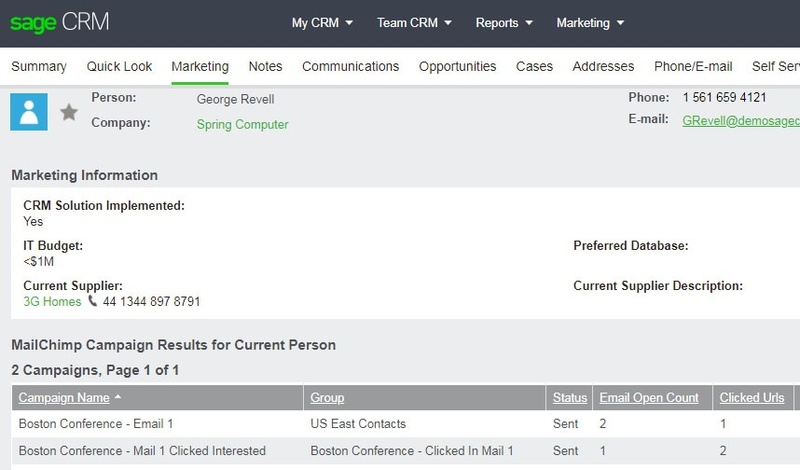 A collection of other enhancements help to make Sage CRM even easier to use. For example, the Main Menu has been optimized for a variety of screen sizes and long item names. No matter what size screen or device you’re using, the main menu is always easily accessible and automatically adjusts as needed. In addition, new Mass Deletion functionality has been added allowing administrators to bulk delete library items, documents and communications associated with a person in Sage CRM. Be sure to get in touch if you have a question about Sage CRM 2018 or need help with an upgrade.